I know everybody loves it, but I am not a huge fan of any pasta, or any cheese for that matter. I also do not love garlic – gasp! And I am of Italian descent – horrors! At any rate, my loving husband asked for pasta for today and since he is doing so well laying off the meat, I agreed. It doesn’t matter that I always agree, I agreed. While checking my email, while waiting for him to go into Physical Therapy, I came across a post for some mac ‘n cheese from Plate Magazine. Unfortunately, for you, not for me, you have to be a member to get their recipes. This one was from Todd Downs, FoodSense, Fort Wayne, Indiana. It only got a 2-star review, but I decided to try it anyway, with some changes of course! The reviewer said it wasn’t gooey or cheesy enough. I am thinking if you wanted blue box macaroni or Velveeta, why would you make a recipe with real cheese in it to start with! Preheat oven to 400 degrees F. Grease a 9 x 11-inch casserole with butter. Cook macaroni in boiling, salted water until al dente, according to package directions. Drain and set aside. In a small saucepan, heat half and half, cream, and bay leaf over medium heat just until little bubbles form around the edges. This is called scalding. Remove bay leaf and turn off the heat. In a larger saucepan melt the butter over medium low heat. Stir in the flour to form a roux. Stir in the Cajun seasoning, dry mustard, and Worcestershire. Cook an additional 5 to 10 minutes, stirring occasionally to prevent sticking and browning, until the roux is quite smooth and elastic. Slowly stir in the scalded cream, stirring vigorously (can use a whisk, but I just use a wooden spoon) to work out any lumps. Remove from heat and stir in the cheese. Season with salt and pepper if desired. I think it is salty enough, but I eat lower-salt most of the time. Gently fold in the drained macaroni. 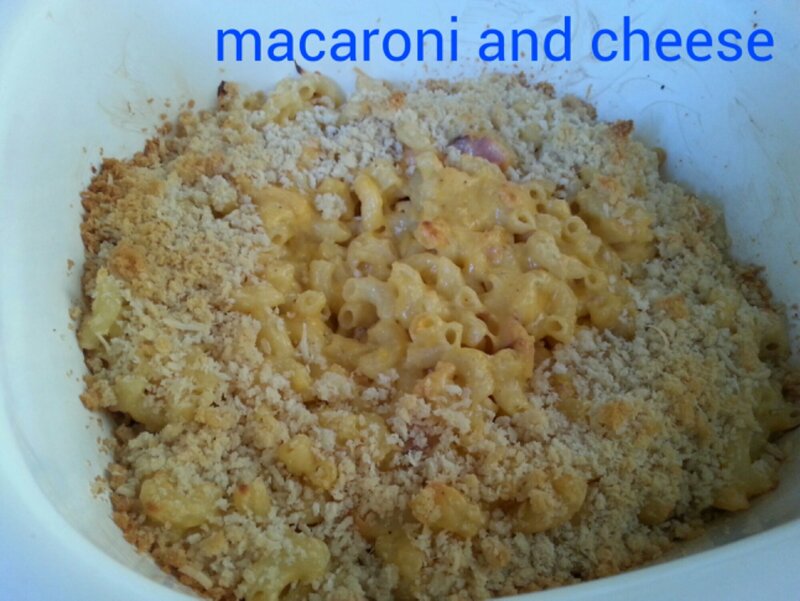 Spread the macaroni mixture out into the prepare casserole. Combine breadcrumbs, Parmesan, and butter. Sprinkle over the casserole. I usually just spread it around the outer edge and leave the middle nekkid. I once had some really good mac ‘n cheese catered from a deli across from the hospital where I worked and that was how they did it. I think that is why it tasted so good. Bake for 15 minutes or so. I like mine sort of lightly colored, not too dark. Like my men. Just kidding. I like dark men too. This was an interesting take on typical mac and cheese. The seasonings are what really make this! I was surprised though that it didn’t really make a sauce. 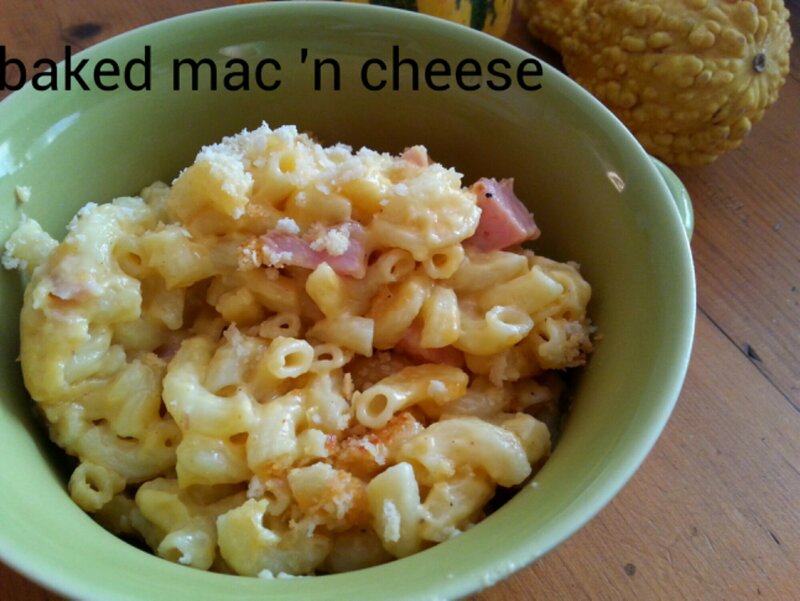 It was dense and very thick, and was a little hard to combine with the macaroni. However, it baked very nicely and quickly. While this is not a creamy mac and cheese, it is still very tasty. Made for Culinary Quest 2014.